Are you ready for a fun week of sneak peaks of an awesome new My Creative Time release? There are so many great sets this month! Okay, let's get started! For my first project today, I made a card using the new Build a Pretty Flower stamp set. I started with an A2 size white card base. Then, to get a red layer that would match my flowers, I took a piece of kraft cardstock and inked the edges of it with Hero Arts Red Royal ink, the darker shade that I used in the flowers. The next layer of the card is a stripe from Simple Stories SN@P Color Vibe. I cut the kraft layer at 2 3/4" x 5 1/2" and stamped a sentiment from the older MCT set, Floral Sentiments. Build a Pretty Flower is filled with all sorts of stamps that have layers to give your flowers dimension. I decided to stamp the main layer of my flowers first with Hero Arts Pale Tomato Ink and then added the next layer with Red Royal Ink. For the outline layer and the stems, I thought it would be fun to heat emboss them with white embossing powder. I then colored in the leaves and the center of the flowers with Copic markers. Now, for this tag, I used the other set we are sneaking today, called Pretty Spring Wreaths. To make this tag, I first took some water color paper and painted it using some old Papertrey Ink Hawaiian Shores and Simply Charteuse re-inkers. Then I used one of the dies from from MCT's Tag Dies to cut my tag. Pretty Spring Wreaths comes with three different wreath bases, and then there are lots of different flowers and other embellishments that you can use with them. I stamped my base with Hero Arts Cup O' Joe ink and then added some flowers with Tim Holtz Distress Inks in Fired Brick, Picked Raspberry, and Seedless Preserves. The sentiments are also from this stamp set. Just BEAUTIFUL Miss Katie!!!!!!!! LOVE! Oh my your card is so precious love the colors and your wreath came out so sweet I was wondering how you achieved that look then found out upon reading your recipe how creative and clever of you I love this look. You are so talented. The card is beautiful, but I love the tag even more! it's awesome! They are both so pretty!! Love the colors in the tag!! 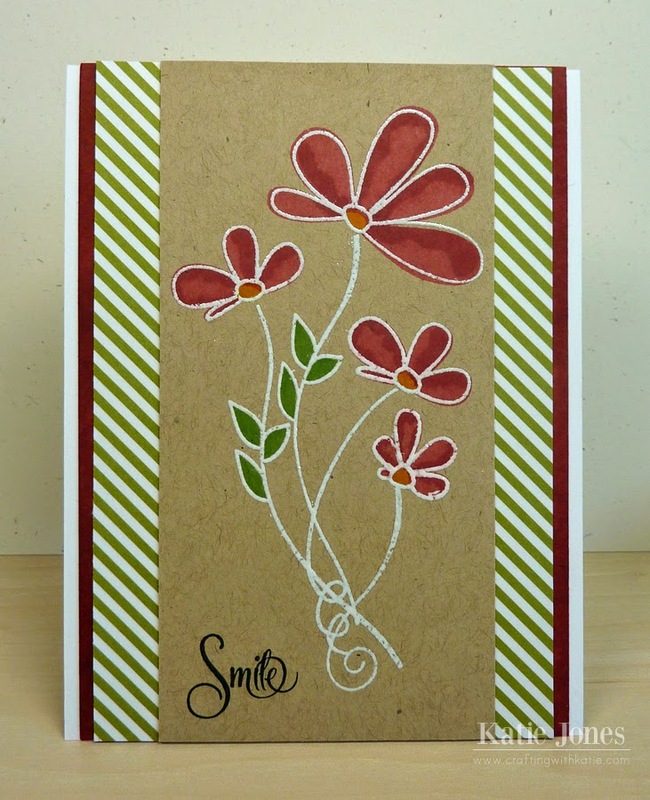 I love your whimsy flower card with the white edge embossing! Both are so pretty Katie...love the flower lines in white on kraft...fab!!! Beautiful water colour tag too!! Such gorgeous projects Katie! LOVE the flowers on the kraft card stock! So pretty!!! Sweet projects! I really like the colors on the tag and the simplicity of the card. These are so pretty!! 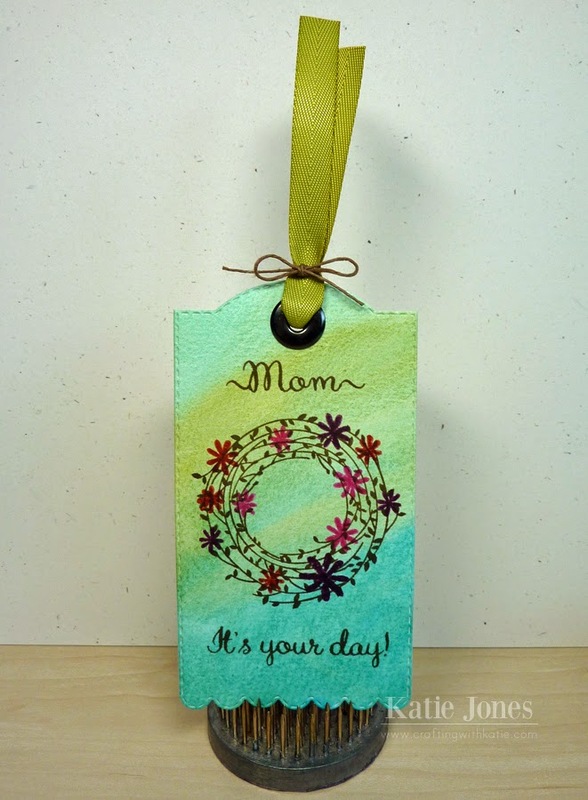 I love how you painted your tag and the card is so pretty with the white ink!! Wow Katie, I am loving your card and your tag! So beautiful they both are and oh how I am loving this sneaky peek. I can't wait to see the rest of the days. lol I don't know how Miss Emma does it, but she keeps coming out with the best releases. Thanks for all your inspiration! These two projects are amazing especially love the card. Good Job! Can't wait to see the rest of the week. Loved how you heat embossed on the first card. I like how the outline of the flower was created not to be a perfect match. It makes the project come alive. Great projects, as usual. Thank you for sharing. I like the white embossing and striped paper on the card and the colors on the tag. Incredibly beautiful projects. I had to read twice to make sure I was seeing that you took kraft paper and inked the edges with the dark red. That turned out great and I never would have thought to do that. I love the effect of the white embossing on the card, too. Your watercolored tag is awesome. I love your projects! The tag is so pretty with the water colored background. I really like the build a flower set on the kraft paper with the pop of white on top! Stunning! Beautiful projects! Loving the new stamps. The white embossing powder just makes your card pop! Love it! Your tag is pretty too!! Wow! Awesome card and tag! The flower card is so pretty. Fairly plain but very nice. Katie you did such a lovely job on your card and tag. I just love the colors on your tag. Beautiful Card and Tag. Great showcase of the sneak peaks. Love the white outline on the flowers and the painted tag..... Gorgeous! I see the Build a Pretty Flower has 3 sizes of flowers. I like the white embossing with the colors. Pretty technique and design. So fun to play with. 3 wreaths? Ok...going to love this one too. I love the color background for your tag and the sentiments are beautiful. Fabulous job on your projects. I love flowers and know I will love playing with these two sets. Katie ~ Oh my your flower card is just BEAUTIFUL! OH my LOVE the white embossing around that GORGEOUS color! Especially on Kraft paper! Then your wreath ~ BEAUTIFULLY done ~ I so need to try the water coloring! GORGEOUS tag! As always LOVE your creations! Super cute card and tag:) Love this new release. Thanks for sharing! both projects are really pretty, but I love the card, is so awesome!!! Very pretty card and tag! Ooooohhhhh, I love both of these stamp sets!!! Love how you can layer the colors on the flowers just by stamping and overstamping! Thanks so much for the chance to win!!! Hope I'm lucky! Very pretty card & tag ~ love them! Katie I love your card and tag!!! 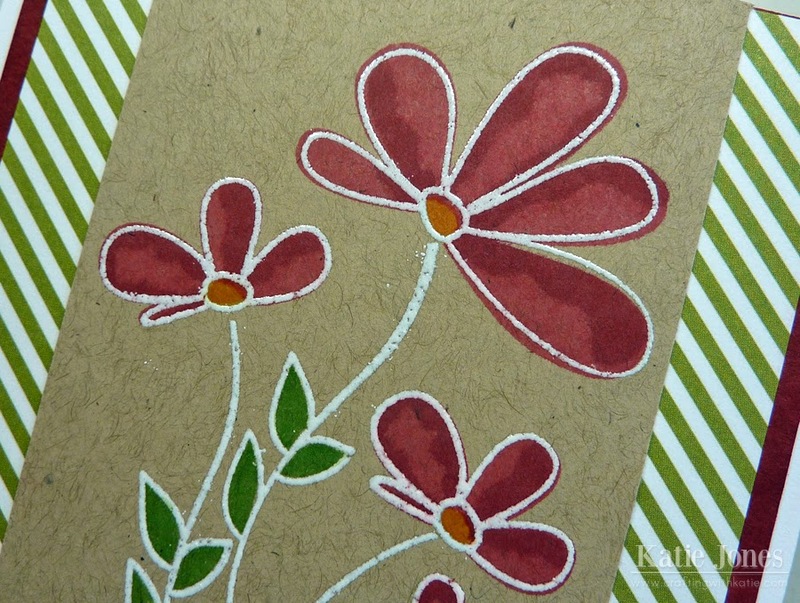 The white embossing on kraft paper, really makes the flowers stand out. Gorgeous projects; love that card! Your tag is amazing! The water coloring background is just amazing! I love the wreath ...great peeks! I like how you used vertical borders on your card and the soft colors on the tag. What a pretty card and tag!!! :) I appreciate your details, too! Love the white stamping on kraft. Your cards are wonderful! Very pretty. What a pretty card! And I just love that tag...the background is gorgeous!! !